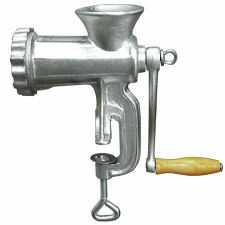 The manual meat grinders provide a simple and affordable way to create your own ground meats and sausages, spiced and flavored to your own taste. These grinders also allow you to determine the amount of fat in your ground meats, allowing you to provide a healthier diet for yourself and your family. Includes 8 piece accessory kit: 4.5mm Grinding Plate for medium grinding, 10mm Grinding Plate for coarse grinding, Grinding Knife, Set of three stuffing funnels: 20mm, 30mm and 40mm with easy attaching universal flange and stuffing star.